Angela Lauther knew she had an unusual thirst. She used to be a ground services agent. Her unusual amount of thirst, no appetite, and weight loss, were a sign to her that something isn’t right. After a trip to the emergency room, she was diagnosed with diabetes type 1. This diagnosis completely changed her life. The diagnosis meant that for the rest of her life, Angela would need insulin injections on a daily basis in order to stay alive. You should know that this type of diabetes needs insulin injections on a daily basis in order for the blood glucose to be regulated. Type 1 diabetes isn’t similar to type 2 diabetes, because the latter can be controlled by diet, lifestyle changed and being active. This diagnosis for Angela also meant that she was no longer able to be a commercial airline pilot. She says that she cried more about losing her dream to fly in comparison to the diagnosis of diabetes. But, now, after around 18 years of living with diabetes, she says that the hardest thing about having type 1 diabetes is accessing insulin. Insulin is the medication she needs to be alive. Angela had to borrow money in order to pay for her insurance; she had to spend many hours on the phone talking to medication companies. She had to switch brands of insulin in order to save costs. She went all to that way that she moved to a different state- Kentucky because it had better Medicaid plan. Also, she noticed other people with the same diagnosis tweeting their stories with the hashtag #Insulin4All. She read the stories of two different people who died because they weren’t able to afford their dose of insulin. She thought that there are more people like her. Since then, Angela has joined a group of consumer activities. These are individuals who need insulin in order to stay alive, and they are furious about the high prices. This group is putting pressure on the three principal companies who produce insulin Eli Lilly and Co. in America, Sanofi of France and Novo Nordisk of Denmark. You should know that the cost of insulin actually tripled between the year 2002 and 2013, and as a matter of fact, it has doubled since then. The list price is more than $300 for one vial of medicine. And the thing is that most individuals who have type 1 diabetes need more than one vial every single month in order to stay alive. This cost is lower with insurance or with different discount programs. However, for certain this price is unmanageable. On this problem, there have been some actions by lawmakers. However, the prices are still rising. Therefore consumer activists such as Angela are taking things into their hands. 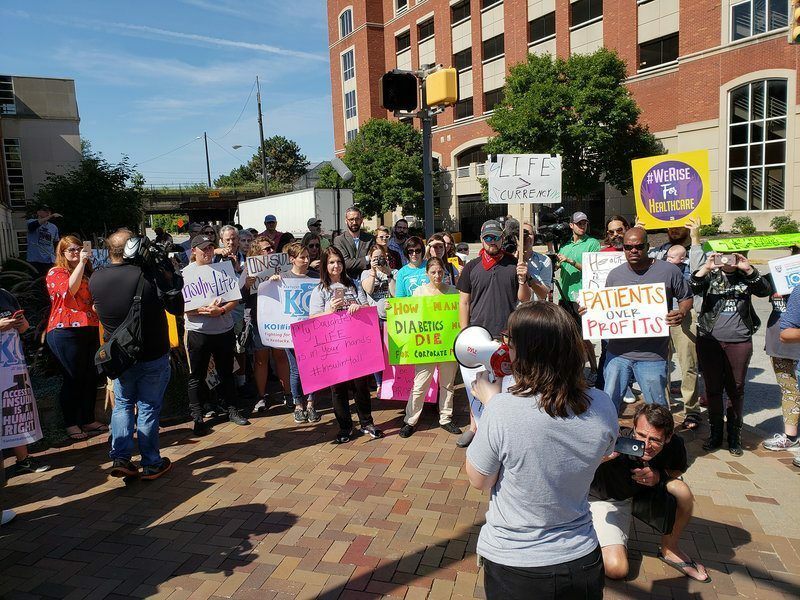 The nonprofit group by the name T1Internation that advocated for Type 1 diabetes worldwide, with a concentration on insulin prices began holding rallies outside the headquarters of the pharmaceutical giant in America Eli Lilly and Co.
Elizabeth Pfiester, founder of T1International, addresses a crowd outside the Indianapolis headquarters of pharmaceutical giant Eli Lilly and Co. in September. The activists were asking for 3 things: transparency about how much it really costs to make one vial of insulin, how much profit there is from one vial and the third thing is a commitment from them to lower the price of insulin. There were protestors from Indiana, Kentucky, Ohio, Illinois, and New York. Angela who lives outside Cincinnati actually rented a school bus with others in order to make the 112-mile trip. Moreover, Angela organized another group of diabetes activists in Indiana, Kentucky, and Ohio by the name of KOI Insulin4All. These activists have met with legislators in all 3 states about making the cost of the drug more transparent and about creating emergency insulin prescription refills. They are also similar groups in Illinois, Oklahoma, Pennsylvania, and Minnesota. All these people are pushing for the same thing – to ensure that the voices of people with type 1 diabetes are heard.